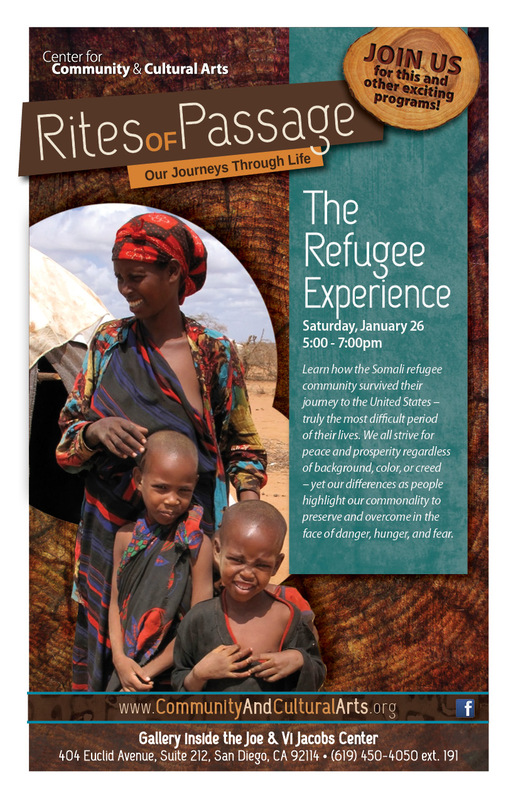 Learn how the Somali refugee community survived their journey to the United States – truly the most difficult period of their lives. We all strive for peace and prosperity regardless of background, color, or creed – yet our differences as people highlight our commonality to preserve and overcome in the face of danger, hunger, and fear. While you’re there, enjoy the Rites of Passage exhibit currently showing in the Center for Community & Cultural Arts. From intricately embroidered hats created by Chinese mothers to protect their babies to the scarring of a young Sudanese man’s forehead, this amazing exhibition uncovers a world of both traditional and non-traditional rites that mark our journeys through life. Through a partnership between museums from Balboa Park and residents from southeastern San Diego, we present this special collection of stories, artifacts, and photos. by Professor Chuck Ambers of the African Museum, Casa del Rey Moro. and proper presentation of certain Samoan rites of passage. Call the Schedule your Group’s Private Tour! The Center for Community & Cultural Arts welcomes your school, alumni association, community group, or organization to a FREE private tour of Rites of Passage: Our Journeys Through Life. Our team of docents and trained volunteer tour guides can provide your members with an informative and engaging walk through the objects, photos, and stories shared by community members and museum partners. To learn more or schedule a tour, contact us at 619-450-4050 ext. 191 or email info@ccca-sd.org.